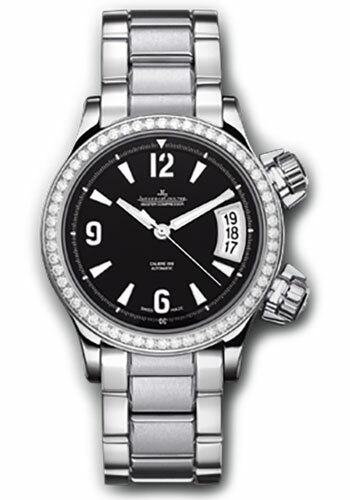 Stainless steel case set with 56 diamonds (1.05 carats), black dial with stamped and luminescent numerals and hour-markers, automatic calibre 899 movement with date, rotating bezel, approximately 43 hours of power reserve, stainless steel bracelet. Water resistant to 100 meters. Stainless steel case set with 56 diamonds (1.05 carats), opaline white sunray guilloché dial with turquoise date, automatic calibre 899 movement with date, approximately 43 hours of power reserve, alligator leather strap with double folding buckle. Water resistant to 100 meters. Stainless steel case set with 56 diamonds (1.05 carats), black dial with stamped and luminescent numerals and hour-markers, automatic calibre 899 movement with date, rotating bezel, approximately 43 hours of power reserve, calfskin leather strap with double folding buckle. Water resistant to 100 meters. Stainless steel case set with 56 diamonds (1.05 carats), black dial with stamped and luminescent numerals and hour-markers, automatic calibre 899 movement with date, rotating bezel, approximately 43 hours of power reserve, articulated rubber strap. Water resistant to 100 meters.